Database Control makes a lot normal administrative tasks easier. You can enable and disable Archive Log Mode with a few mouse clicks as this document will detail. If you would like to do this through the command line take at the post Enable/Disable Archive Log Mode 10g/11g. Note: It is recommended to perform a backup of the database (after a shutdown normal or immediate) prior to changing the archive status of a database. 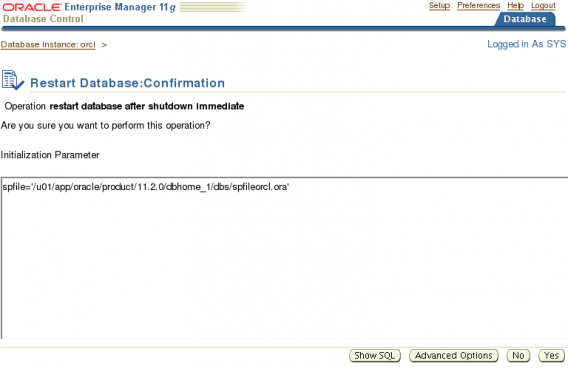 Log into Database Control and click on Availability tab. On the Availability tab click on the Recovery Settings link in the Setup section of Backup/Recovery. On the Recovery Settings page, scroll down to the Media Recovery section. 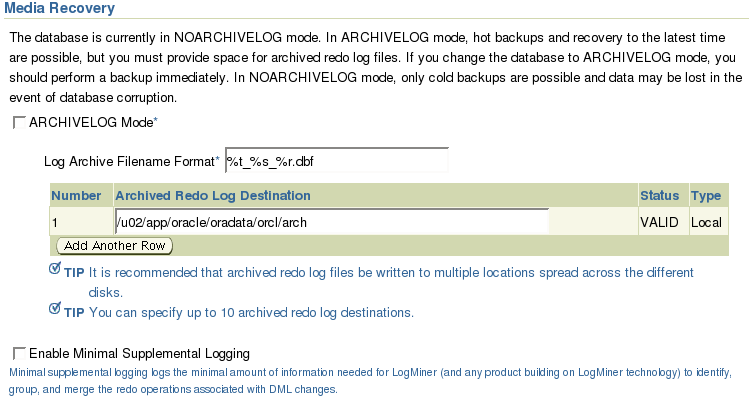 Note that this section currently states that the database is in NOARCHIVELOG mode. You can change that by putting a check mark in the ARCHIVELOG Mode box. You can also add or change the location in which archive logs will be written as well as the log name format. Check the ARCHIVELOG Mode check box and click the Apply button on the upper right of the page. The database must be restarted for the changes to take effect. Click the Yes button to continue. 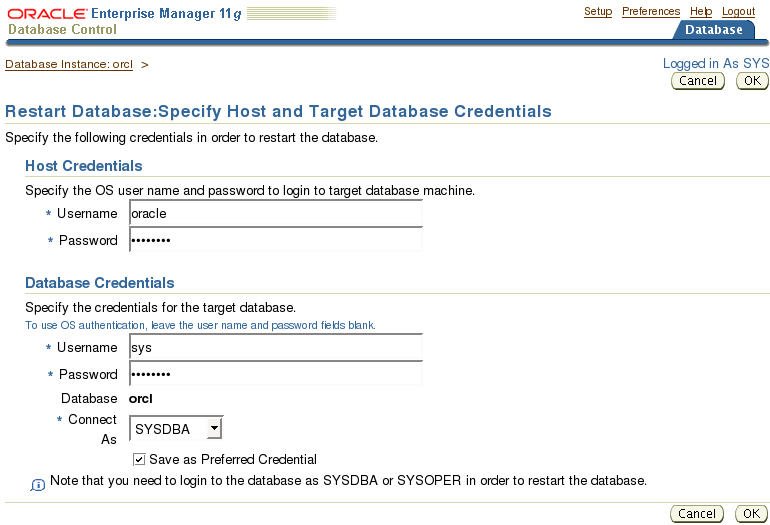 On the next page you will need to provide credentials for both the Host (OS) and the Database. The OS credentials must be valid for the machine in which the database is hosted. 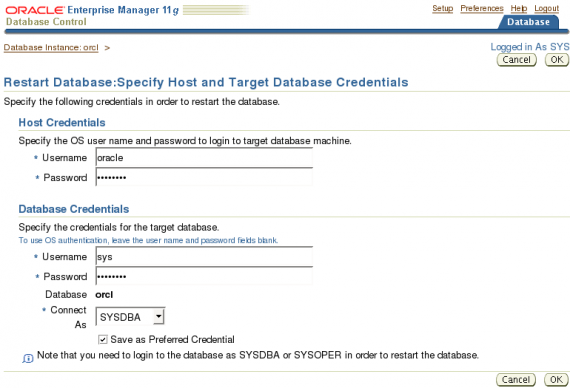 The database credentials must be able to log in as SYSDBA or SYSOPER. You can save these credentials as Preferred Credentials. Once you have entered the credentials click the OK button to continue. This page is asking you to confirm the operation. 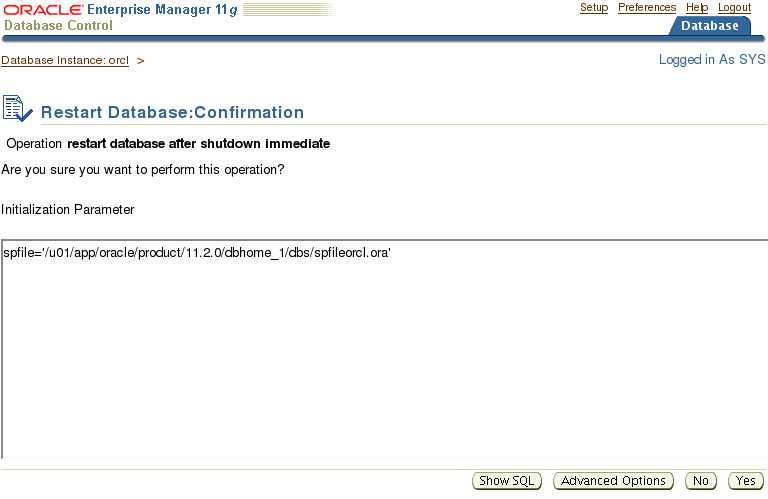 Note that restart database after shutdown immediate is all that is given for the operation. Click the Show SQL button to see all that will be done. Here you can see that the database is being shutdown and started back up in mount mode. Next ARCHIVELOG mode is set and the database is opened. Click the Return button to go back to the Confirmation page then click the Advanced Options button. Since the operation is a shutdown we are provided the ability to choose the type of shutdown. An Immediate or Normal should be used since we are changing the database log mode. Click the Cancel button to go back to the Confirmation screen. Once the Confirmation screen appears click the Yes button to start the process. Once the process is complete you can navigate back to the Recovery Settings page and you should see that the database is currently in ARCHIVELOG mode. We see that the database is currently in ARCHIVELOG mode. In order to disable ARCHIVELOG mode simply uncheck the ARCHIVELOG Mode check box and click the Apply button found on the upper right of the page. Here you can see that the database is being shutdown and started back up in mount mode. Next NOARCHIVE mode is set and the database is opened. Click the Return button to go back to the Confirmation page then click the Advanced Options button. Once the process is complete you can navigate back to the Recovery Settings page and you should see that the database is currently in NOARCHIVELOG mode. Thanks! What I was looking for. 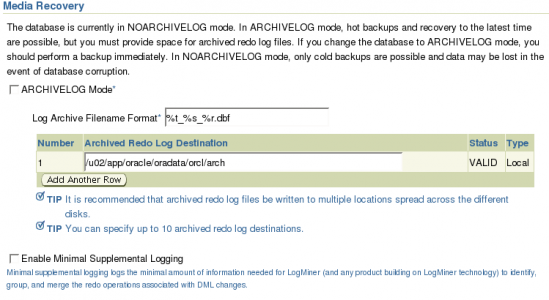 You can add topic, how to remove archive log files from server after switching to noarchive mode.